You would never guess from the business-as-usual appearance at the Eye of Horus Metaphysical Store that the owners are faced with the sudden challenge of relocating it by the end of this month and finding the funds to do so. As I enter “the Eye”, I am still greeted by the customers browsing, buying and getting their questions answered by upbeat staff. Stones of all types glisten beside cards stating their magical properties. A client seeking spiritual guidance exits into a room with one of the divinational readers. In the background a CD plays musical selections from an upcoming Wendy Rule concert being held there this Sunday. Thraicie Hawkner, her long silver hair flowing down her shoulders, and Jane Hawkner, with a short, cute pixie cut, approach me from across the busy room with undaunted looks on their faces. Their confident appearance shouldn’t have surprised me. They have been running The Eye of Horus since October 31st 2003 in a previous location just a few blocks from their current space and even earlier as an internet business with booths at community gatherings. Meeting the challenges of entrepreneurship over the years has made them seasoned businesswomen with a fair amount of mettle. But, even so, finding out the first of July that they would need to find a new space and move the store into it by the end of July, would have been enough to make even experienced business owners sweat. Eye of Horus has a GoFundMe website that enables people to either purchase “perks” or make a straight donation. 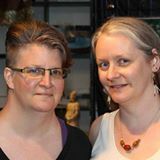 The perks are in the form of discounted services such as divinatory readings, therapeutic massage, discounted gift certificates, or a book shelf in their name. In this way, people can choose to donate or purchase “perks” at attractively discounted prices. Both Maren Ward, Halloween Artistic Co-Director, and Mark Safford, Section Designer and a performing puppeteer in this year’s show, refer to the annual BareBones theater production as a ritual. This tradition, always staged during Halloween season, explores where life juts into death. For its 20th anniversary, that ritual explores grief. Barebones theater, a collective of acrobats, puppeteers, actors, 2-dimensional artists and interested volunteers are an exotic staple of Twin Cities Halloween celebrations. 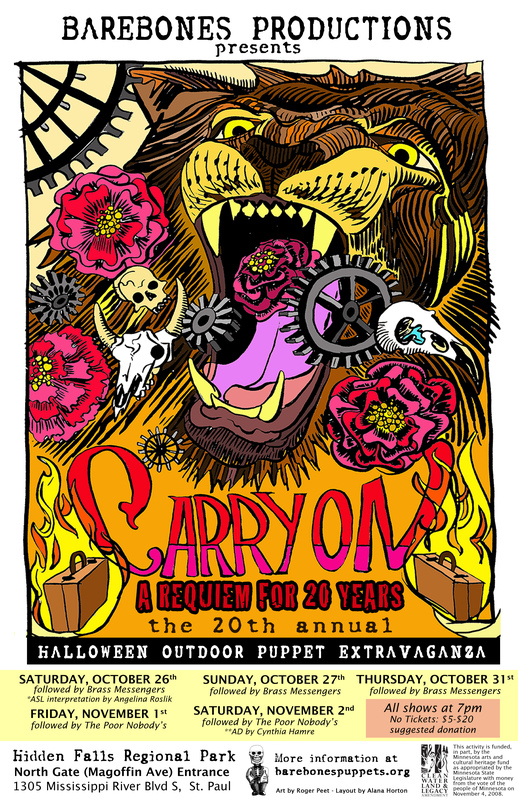 This year’s play, Carry On: a Requiem for 20 Years, hosts visiting artists from years past and even includes the reprise of the character Jack Pumpkinhead, taking the ne’r-do-well on another misadventure as played by Julian McFaul. Participant-creators describe this year as invoking a little bit of Dia de Los Muertos and a little bit of Kali Ma. Among other returning artists is Roger Peet, a printmaker and visual artist. He did this year’s poster design and is creating the two dimensional images used in the spectacle. Every year the story is developed at a community brainstorming session. This year, several primary designers suffered significant personal losses and those sorrows gave direction to the show. The implicit story explores grief as process and time as predator. Says Ward, “[The actors] are going to have grief-cases with little stories of their own personal grieving – a story about a person that they lost, about not having children, about global warming, grieving the glaciers -looking at different ways of being impacted by grief at a personal level.” Time itself will appear as a giant cuckoo clock that processes mourning with a carnivorous energy, acting as a giant grief monster. Other surreal moments in the evening’s journey will include a dance of marigolds, tea with spiders and ultimately coming face to face with a giant grief monster. What initially drew a few dozen audience members expanded over the years to over 1000, enough for the city of Saint Paul and Hidden Falls Park to increase its park use fee from around $50 to $7500 to cover the use of porta-potties, insurance, security and technical gear. In addition BareBones had to pay its artists and fund the pieces used in each production. The years the collective has received help in the past from Bedlam Theater and Heart of the Beast Puppet Theater. This year, in addition to these fees, the company is attempting to raise funds to pay for the show and its attached party, as well as to cover the travel costs of some of the collective’s returning artists. All performances are at Hidden Falls Regional Park. When planning your attendance this year: dress warm, bring a blanket, try to carpool and they do supply bike racks. Visitors need to bring flashlights; no alcohol is allowed. All shows are followed by a performance from the Brass Messengers. The food and drink after the show is supplied by Sisters Camelot. The afterparty runs until 10 pm. If you wish to contribute to BareBones Theater extravaganza, visit their IndieGoGo page. All funds raised provide free food to theater crew and audience, cover travel costs of visiting actors and pay for the show the following year. All shows start at 7 pm. Bike racks available. Carpooling strongly encouraged. A local domestic rabbit needs a new home. Can you help? 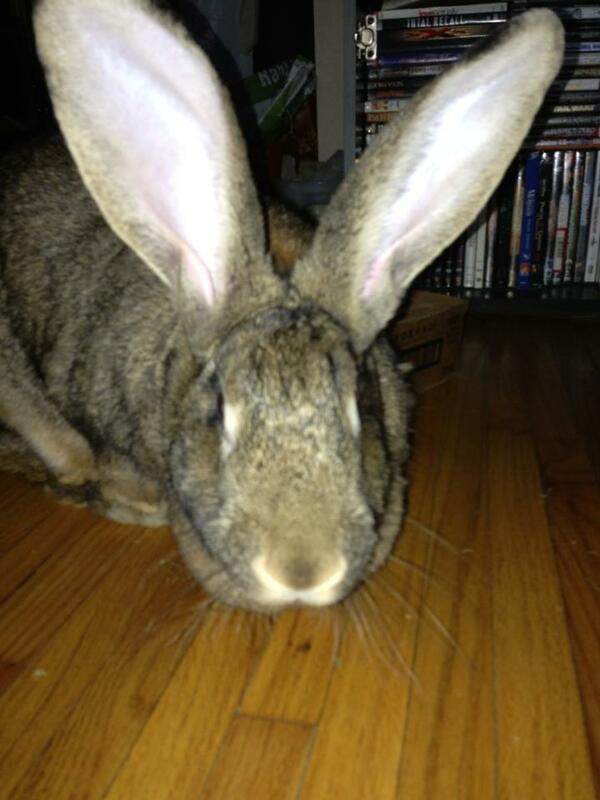 Nora, a Plymouth area rabbit, needs a new home. Roads have opened and power is restored after the storms that led to an up to a 96 hour blackout in the east and west Twin Cities Metro. As flood warnings appear daily, those with severe damage to their homes scramble to house their families and pets. Some pets are more difficult to place than others. 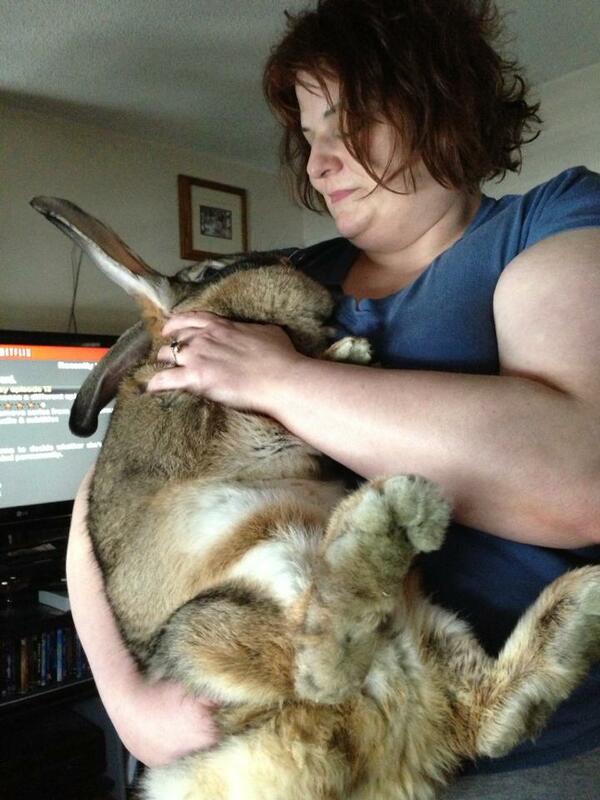 Such is this case with Nora, a 20 pound Flemish Giant rabbit. Sheryl Burns, Plymouth resident and member of Standing Stones coven, is looking for someone to adopt Nora. A large tree fell on the Burns residence, forcing the family to relocate for an estimated 4-6 months. 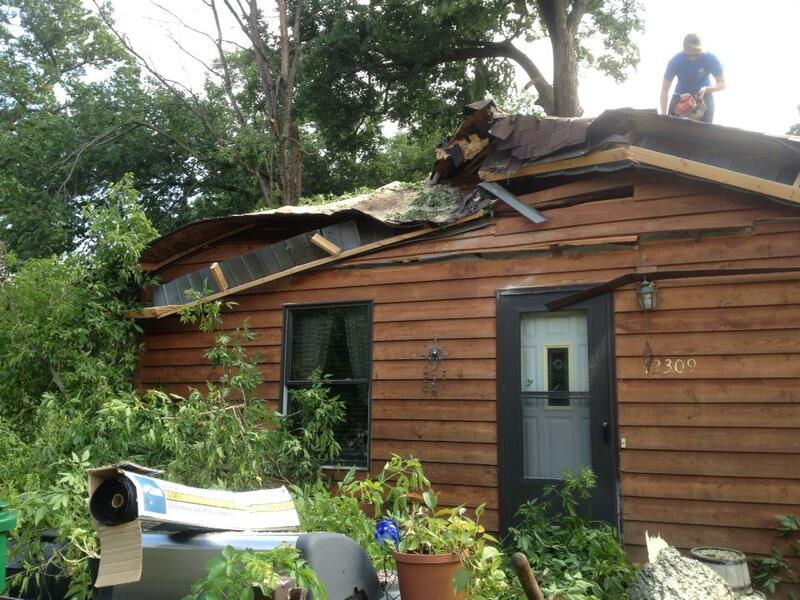 The Burns family home sustained significant damage from a fallen tree. The family received assistance from family, neighbors and coven but still have significant decisions to make during the coming cleanup. In the meantime, they need to find a safe place for their pets, including Nora. Nora is going on two years old and is 75% litter box trained. She bathes well, but only cuddles on her own terms. She is quite fond of plastic and cords, along with more safely edible objects such as apples, carrots, lettuce and rabbit pellets. She has always been an indoor pet; she has only visited a backyard under supervision. Nora also has experience cohabitating with cats. She has also not been spayed. Burns can supply her kennel and all remaining food. If you wish to give this rabbit sanctuary, please contact Burns at gosmr7@yahoo.com. I talked to Lady Yeshe Rabbit of the Come As You Are (CAYA) coven. 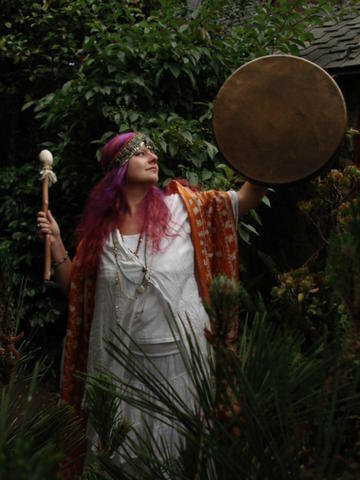 We talked about her work in the San Francisco Bay area, her appearance at Sacred Harvest Festival, and her thoughts on gender issues in the Pagan community. How do you like to be addressed? For the most part you can call me Rabbit. My title in my coven is Yeshe, it is a word that has a few different meanings. In Tibetan it means “primordial wisdom”, and that is why I took the title, because I wanted to be guided by that primordial wisdom that resides within. It was also a childhood nickname, because I am Polish and my birth name is Jessica. CAYA coven is my coven. There is within CAYA several different layers of membership. Some people have a casual relationship and may just attend our rituals. There is also an inner circle of trained clergy. These are people who have been with the group for a number of years. They would be my ‘closer’ coven you might say. What is the role of CAYA in the Bay area? CAYA stands for “Come As You Are”, and it is a coven that is built around the principles of eclecticism, inter-faith, and support for a wide variety of different paths. An individual who maybe has a very strong personal path, or, one who might be just starting out and wants to learn about many different paths to see which one is the right fit, would find themselves very comfortable in CAYA. Each of us in CAYA feels that it is the utmost importance the we determine our own personal relationship with the divine. We then share our own individual practices and spiritual beliefs in the spirit of generosity without presuming that we know the one way that is right for everyone. What that means is that we are a coven “filled with solitaries” (jokingly), because everyone has their own individual practice. When we come together we join around a central core of protocols of how we do rituals in an outlined format, a baseline of ethics that we have all agreed to, and principles of community that we think are essential: Cooperation, conflict resolution, clergy conduct and comportment. When people come into CAYA they feel very welcome, even if a beginner, or if they are extremely experienced and just don’t want to be told what to do because they are confident in their own path.